Fun crochet toys, accessories and clothes for you to make - FREE! You'll find all your favorite game and cartoon character patterns to make like Pokemon, Digimon, TNMT, SONIC, Mario Brothers and more! All patterns are written assuming that the reader has a basic understanding of crochet and amigurumi, IE: working in rounds, sc increase and decrease, basic understanding of construction of the parts. This pattern has been a long time in the posting. I've argued with myself over whether or not I should sell this one, but I just couldn't do it. I know it would sell well, and I surely do need the money, but the whole reason I began making these FAN ART plushes was because I know very well how hard it is to find good patterns to make things like these for the kids. I started out looking for patterns to make for my kids, and I found none that I could afford and so started making them myself. I will mention though that if anyone feels inclined to make a donation for the patterns I offer for free here, I have a donation button on the right hand side of the page, the amount is up to you and every donation is deeply appreciated. 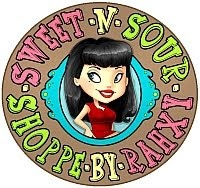 I do have an Etsy shop where I sell some of my original designs, but I do not sell FAN ART patterns there, those patterns I always offer for free here, because I don't believe FAN ART should be shared on condition of payment, it's a labor of love. Ok... the pattern. This is a more complicated pattern than most of my plushes on here. That's mostly due to the fact there are many smaller parts ... but they aren't really difficult, just different. I have checked the pattern many times and I feel like everything is there and is right, but if you run into anything that gives you trouble, just message me, I will be more than happy to help you. I try to check email at least three times a day if not more often. All the pictures are clickable so you can see them in larger size and get a better idea of the details such as ears, sideburns, etc. I tried to get as many different views as possible. Gauge isn't all that important, but your hook and yarn choices should result in a fairly tight stitch so that the stuffing won't show through. Numbers in ( ) at the end of each round or row indicate the total number of stitches for that round or row. Begin stuffing at this point if you haven't already. Stuff head firmly while shaping as you go along. F/O, leave a tail for closing. Add any bits of stuffing needed to finish shaping the head nicely. Weave tail through the final row and draw up tight to close. Secure and weave in ends. F/O weave in tail. Stuff and shape. Ch 7, slip stitch in 2nd ch from hook. Ch 5, slip stich in last ch. Stuff and shape body firmly. Leave neck opening open. Attach red yarn to any of the 'free loops' inside of last round of stitches in hand. F/O stuff firmly and shape them both evenly. Don't close the open end. F/O and weave in ends. Row 1: ch 15, sc in 2nd ch from hook, ch 3, * sc in next ch, ch 3 * (repeat from * to * to end of chain) end with sc in last ch. I highly recommend pinning all the pieces together before sewing anything to make sure you have all the pieces done right and that you get them in the positions you like best before sewing. It seems like alot of extra work, but this will save you ALOT of hassle. Sew head to neck opening. Sew hat to top of head as shown, giving a slight tilt backwards on the head. Sew the 'hair' to the bottom of the hat at the back (see the photos). Nose is sewn centered on the face with the brim of the hat, but a little lower on the face. Mustache is sewn under the nose much like the hair was at the back of the head. Ears should be placed just at the base of the hat on the sides of the head. Experiment with the placement so that you can be sure you're happy with how the ears look. Sideburns are sewn just in front of the ears as shown. Arms are sewn to the sides of the upper body near the base of the head. If you made the version with the thumbs, be sure to pay attention to the position of the hands and that the thumb is in the right place. Hands should be slightly curved inwards. Suspenders are sewn on as shown (crossing them in the back). Add the two small yellow (or gold) buttons to the suspenders where they meet the 'pants'. Legs/feet are sewn to the bottom of the body as shown. Eyes are constructed from a larger oval shape in white, with a smaller oval shape in blue and another even smaller oval shape in black (see photos). I also like to add a tiny white circle of felt as a catch light to the eyes to help give some dimention. Mario and Mario Brothers are copyright Nintendo. This pattern is an original pattern by Linda Potts (August 2009). Please do not claim this pattern as your own. If you wish to share this pattern, you may link to this pattern but please do not reprint it on your site or publish on any cd or collection. You may keep a copy for your own personal use but you may not sell or distribute it, or sell items made from this pattern. Photos are also property of and copyright Linda Potts. I love it! I love Mario!! I love him! thank you for the gift! You're pretty much a crochet genius. I haven't made any of your patterns yet but I most definitely plan to sometime soon. Thanks for sharing them! You do exceptional work - you've nailed Mario to a "T"! aww cute, that is sooo cool, can you make a shelled turtle please????????? 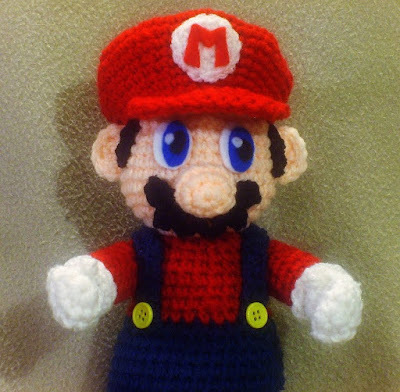 This is the best crocheted Mario I have ever seen. My brother would love it. I was wondering though, do you know what the name of the color for the skin was? I can't seem to find a color that looks like skin. Thank you for posting this awesome pattern! THANK YOU!!!. I've been looking EVERYWHERE for a pattern of super mario that was both cute and easy to follow and you've provided both. Thank you very much, Crystal! I'm thrilled your sister likes her Squirtle. The one that I made for the photo in the pattern, was given to a little boy who's father was killed in Afghanistan... he hasn't put that doll down since. LOL. I simply love to see and hear about the dolls making people happy! As for your inner debate on whether to sell the pattern or make it a freebie, you chose the right option! Mario is a licensed character, and therefore the pattern cannot legally be sold without written permission from the company who owns it (Nintendo). I wonder how long it would take for Nintendo to get back to you with an answer? Hmm... Probably about as long as it takes me to get a rebate check in the mail. Lol. Yes, I know about the licensing situation with these characters, but to be honest... it doesn't stop anyone. There are hundreds if not thousands of people selling patterns they've made of characters, and frankly, some of them are really bad. I still couldn't bring myself to do it tho, because even if mario was awful, I make these FAN ART patterns simply because I love to do it... I don't think it should cost people more than their own materials to be able to make a character like this for themselves or someone else. Thanks a lot for the pattern! I've got a niece and nephew that are Mario FREAKS!...So I'm gonna make all you Mario Bros. patterns for them for Christmas. I let my nephew see it and he started jumping up and down saying: "Will you make me one...huh? huh? huh?...PLEASE!!! sooo cute, i love mario bros, you are sooo nice to give him 4 free!! This is like the coolest thing ever. Umm I have a question about it. what do you mean by alternate arm/hand. is that just the arm without the thumb or what? This is really awesome! I made your Luma pattern for my friend and she loved it. Thanks so much for keeping these patterns free. I can't really afford much more than the supplies. To me, crochet is supposed to be inexpensive. I get all my patterns free off either your site or crochetpatterncentral.com. They have links to just about anything you could ever want. That's how I found your site in the first place. I'm so glad I did! Please keep posting more patterns! I look forward to making every one eventually. They're all just so cute! Thanks again! My sons will love Mario & Luigi! When I was little my Nana would make us something every yr for Christmas. I started this when i got married. I make my whole family Something every yr. These will be great for my boys. THANK YOU!!!! Do you have a pattern for Yoshi? I am in the process of making for the boys across the street. They are huge Mario fans. I am making 1 Mario and 1 Luigi. It will make great Christmas presents. Especially in these times. Something not so expensive and they will love. Thanks for sharing of your pattern. Your Mario and Luigi patterns are nice, but I got a little confused at the moustache part. I had a long chain of pekoes! I thought that I was supposed to continue slipstitching instead of slipstitching in the one before the last slipstich--does that make any sense? Nevermind. I worked it out fine, but I just have to say that I had no need to do the first 'sl st in 2nd ch from hook'. Was that a typo? Excuse me but I get a bit confused on the brim of the hat. Can you please send pictures of the way you did it. Thanks for sharing this. I will watch your list from now on. Love this! Friend of mine wanted a amigurumi mario, I was just going to wing it, but now I don't have to! Thanks so much for sharing! Oh, wow! I just made your Mario and I absolutely LOVE him! Next up, Luigi! Your patterns are fabulous. I'm going to make some of your Nintendo patterns for my brother for graduation! I love following your work. You are very talented! This is the most amazing thing I've ever seen EVER!! Thank you for posting this for us!! Thank you very much ! I have made someone very happy with this Mario. It looks great! These are amazing! My roommate has finished Mario and Luigi and is now working on a goomba. Everyone who has seen the finished products have wanted one for themselves. Your patterns are so cute! We would love to see a yoshi or a bowser pattern! Thank you so much for sharing these. Well, I've got all the piece done and I'm going to start putting him together tonight. Question for you - do you think that I could use your hat pattern to make a hat to match for my 4 year nephew? If I maybe used a bigger hook? Your insight would be greatly appreciated! Thanks!! 1) DO I have to stuff the Hat a little bit before attaching it to the head? 2) My hat seems to be too big for the head. I'm not sure if I made the head too small? Is that hat comparatively larger than the head? Than you so much! You are very gifted! It could be a combination of things, but the hat should be a bit wider than the head but then should get a little tighter at the part of the hat where it meets the head (see the photos). I DID stuff the hat a little bit, *just* enough to get it to the shape I wanted, but not so much that it made it too puffy or out of shape. Thank you so much for this pattern WolfDreamer! I made one of my own and only made a few adjustments, mainly because I used two different brands of yarn in the same project. cool, apreciate the quick reply. thanks. You´re so generous, I just found your great patterns and my 6yo son being a fresh SuperMarioFan will freak out if he sees this! Do you think of doing more Nintendo Patterns such as Donkey Kong, Wario or my favourite, the piranha plant (aka Pakkun Flower) ? I can´t wait to try you patterns, thank you! i love making this so far, but am running into brain freeze with the mustache. i simply can't make out the instructions. i'm sure it's very straight forward, but I'm a beginner so please help! i've done ch 7, sl st in 2nd. do i just chain an additional 5 on top of that? and then? what does '(slip stich) in next chain' refer to? same as '2nd chain from the hook'? i'm guessing not, cause that looked wrong. thanks! Thank you so much for these wonderfull patterns. I just finished making Mario for my son. He loves it. Will make more of the nintendo plushies. so i ran into another little problem making the feet. for the last round it says to sc 1, then decrease over 2, and it should generate 8 stitches from original 14. it doesn't come out right for me, so i'm wondering if i'm missing something. i don't think my previous comment regarding the mustache was posted, so i'll try again. thanks for the clarification, however i'm now wondering where the last slip stitch goes (chain 5, slip stitch in last chain). for me, the chains are all used up at this point. thanks! this is really cute! i tried making this, but his head keeps falling to the side. do you have any suggestions on how to keep his head up? You are truly amazing! I have fallen (yet again!) in love with Mario and Luigi, thanks to your patterns. My son will love these, I can't wait to start. Will you PLEASE consider designing a Princess Peach? I can already imagine her beautiful dress... The collection will simply not be complete without her! I made this pattern which you so kindly shared with us. Do check it out on my blog please. I value your opinion. I made Mario an extra pair of trousers because the white stuffing was showing through without it. Hey Sonia, saw your post and thought that I would hel you out, A magic ring is a crochet method to start crocheting in the round without leaving a large gap in the center. I'm sure if you look on youtube or even just type the term into google you will be able to find some quality tutorials out there on how to make one, it's really eay when you get the hang of it. Good luck! I love this Mario pattern- couldn't be more perfect! However- I couldn't help but notice your Mario cast is incomplete... I'm a huge fan of Yoshi (I absolutely ADORE that dinosuar!) and was hoping you could make a pattern, if it's not too much trouble. Thanks! The mustache is pretty difficult, but I'll manage. Think you could make a Yoshi? I recently made Mario for my grandson and he absolutely loved it! I now have requests for Luigi and Toad & Toadette. Thank you so much for sharing your patterns with us! I love them all! Wow ! I'm not good enough to do this right now, but one day I'll do it ! Thanks a lot for this pattern, this is really nice to you to share. I really appreciate your talent with all these patterns and I think it is absolutely wonderful of you to offer them for free! I am having trouble understanding the decreasing pattern on the hat. I can get to the 54 stitches but am not sure what the decrease pattern would be to end the next round with 45. If you could help me that would be great! thank you! totally get it now. You have just saved me. Thank you SO VER MUCH! He's adorable! I added him to my Ravelry queue. Thanks for sharring! Hi! This looks so cute! I'm a bit confused though - can you tell me what you mean by ?magic ring"? Is this just a ring of single crochet or something different? Thanks again! I just made a Mario and it's great! My friends love it-- I've shared photos and a link to your blog on my FB account. I put my Mario's legs in front, so that he is in a sitting position. Thanks so much for creating such wonderful patterns for everyone to try out. I really appreciate it. Thank you so much for creating such a cute stuffie. I am making Mario for my son for Christmas and I am having trouble on the hat. After sc the 54 stitches the next line says to sc in the next 4 sc and dec over the next 2 sc. Dec stands for Decrease, otherwise known as "skip 2 sc" right? That's how I did that part in the head for instance but for some reason it's not turning out on the hat. I have 54 stitches but when I do that dec (or skipping 2sc before I do 4sc again) I only get to 38 total stitches, not 45. What am I doing wrong? You need to complete a total of 9 decreases in the round. Skip one sc not two. Skipping 2 sc is decreasing by far too many in the round. It's really better if you work a decrease in this way: http://crochet.about.com/library/bl_decrease.htm instead of skipping stitches. Thank you so much. That makes MUCH more sense!! Great work on these patterns. I will make the rest of the dolls for him for his birthday next year!!! can you explain row 13 on the hat where you attatch the yarn.it says to attatch to stitch 6 of unworked stitches of round 11,but didnt you wrk all stitches in rd 11? Yes, you did work all the stitches of round 11. But in round 12 you only work 25 sc, leaving 11 stitches unworked and those 11 stitches are on round 11.
thankyou so much for answering all questions.you are a genious with your patterns and are so generous to share them.i am excited to make mario because i have 2 grandsons that absolutely love him. what is the magic ring you talk about? how do you make it? Thank You so much for sharing this pattern! It's WONDERFUL! And mine is coming along pretty nicely. The little boy I'm making it for has a Luigi, but has been missing Mario and I think he's really gong to love it! This is great my boys and nephew will love him!! great design!! thanks so much for sharing it!! thank you for this awesome pattern. i just finished all the pieces to make mario for my 4 year old. now i am wondering if i sew them together using yarn and an embroidery needle as i would for a knit doll or do you use needle and thread? i think this is a silly question now that i type it, but i am a knitter and just making sure i follow crocheters rules for sewing the parts together. do you use a certain stitch? thank you for taking the time to answer! Some people prefer to use the yarn and a yarn needle to sew the parts together....others use sewing thread and a sewing needle. I use sewing thread (doubled of course) and needle to assemble my dolls. I find it creates a durable joining without any extra bulk added. Hello and thank you for posting this wonderful amigurumi pattern! I am making one for my boyfriend now and I think I might have come across a mistake/typo in the pattern. I think that either the 8 or the pattern might be incorrect. When I do "sc in next sc, dec over next 2 sc", I end up with 8 sc in my current round and two sc still left to cover from the previous round. Maybe I am doing something wrong? Thank you for bringing that to my attention. That is a mistake that was corrected once LONG ago, I really don't know why it suddenly came back, but I've fixed it again. It might have something to do with the 'outage' a couple of days ago? I don't know but I had corrected a long time ago. here's my finished mario! thank you so much for these awesome patterns. i am definitely going to be making more in the future. so much fun! Ok, I can't wait to try this pattern but I have a question before I get started. What is a magic ring? Where can you get one? I've been crocheting for many years and have never heard of this. Thanks. Thanks so much for providing your pattern free of charge!! As a college student I cannot afford to pay for patterns right now and I have two little boys in my life who are going to LOVE, LOVE, LOVE your Mario and Luigi plushies. You are a genius! This pattern is really awesome =D. I just finished making this for my son, today, and he was SO excited! Your instructions were written so well & were so easy to follow, and the results are fantastic! THANK YOU SO MUCH! Hello! My name is Antonia. My son is writting this because I don't speak English. I really want to thank you for the Mario pattern and congratulate you for your blog and for sharing your knowledge with all of us. Bye! This is SUCH a cool pattern! I'd luv 2 c a princess peach! Please!? Thank you for such awesome patterns, I am doing Mario and have everything crocheted, but cannot get the hat. Have it to the brim, and it just is not coming out right, i am picking it up at the wrong place or something. I have tried and tried and just can't get my mind around the right way. Thanks again for the awesome patterns, and would appreciate any help you can give. I love this pattern - I've used it 3 times, and for some reason, I just CANNOT get the hat right! It always ends up ENORMOUS in comparison to the rest of Mario! I think in the future, I'll use a smaller hook there! Thanks for sharing your patterns, Linda! Thank you so very much for posting the world of Mario Land to crochet. My sons and husband are such huge fans. My husband cannot wait for me to crochet him some of these so he can show them off at work. My two boys were Mario and Luigi for Halloween last year and these will just be amazingly adorable. Every time someone asks where I found these, I give WolfDreamer credit and send them to your site. Love your talent, thanks a million for posting. Thank you very much for the pattern, my boy is a very happy boy now! Mario es precioso!! y Luigi tambien, yo he empezado hoy a fabricar a Mario, la cabeza y el cuerpo......la parte azul, lo he hecho muy bien, sin problemas, pero al llegar al bigote y sobre todo las manos, no entiendo nada. Que quiere decIR Capítulo? ?....y bucles libres??. como hacer manos, y los términos que he descrito. 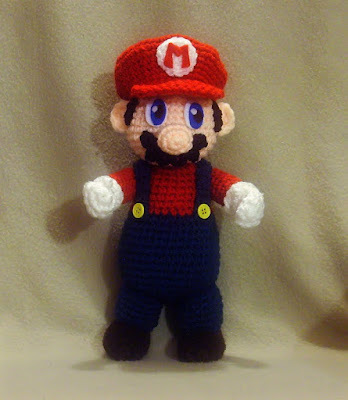 Muchas gracias, espero noticias ok.
i know a person who is a big fan of Mario so I will crochet him for him. I wan to know , have you thought of trying to do Betty Boop? I'd agree with Anonymous - Betty Boop; I've been looking for a plush pattern for her everywhere, but can't seem to find one. I'm sure you get requests all the time, though, but I hope someday you will do one! Thank You for the free pattern! You truly are an artist! Not too sure about the sewing of the parts. Could you give a few pointers? I love it!! I've made one of these, and also a Luigi of yours, and they are adorable! I was wondering if you could perhaps make a Yoshi pattern? I would like to complete my trio, and I can't find a good Yoshi pattern ANYWHERE! Thank you, thank you so much for your patterns. They truly rock! I have one small request to go along with all the hundreds you have.... my daughter loves Ponyta... and i would love a pattern, especially one of yours. Thanks again! Do you sell any of these? They're so cute! I really want one!! I've been wanting a pattern for Mario for YEARS! I found this via Ravelry and your mushroom patterns. WONDERFUL! Thanks for giving the pattern away. Ok so I'm quite new to crocheting and am wanting to make this for my husband and am curious as to what you mean by magic ring? How do you attach the new yarn to the 6th st. of rnd 13 for the hat? Do you simply tie it on or is there some technique to attach the new yarn as the normal technique to change color won't work? BTW, I learned to crochet simply so that I could make this pattern! As you work the next three or four stitches, hold the 'tail' of the new yarn along side (on the back) of your stitches, and work over the tail to anchor it in. You may need to 'tug up' on the tail a little bit to make that first stitch even with the rest. But don't tug too tightly or you'll distort that stitch. Leave the rest of the tail 'dangling' for now, and later you can go back and using a tapestry needle, thread it back through (in the other direction) of a few stitches and trim it off. Hey I luv ur patterns. I really wanna crochet a princess peach!! Please make one!! Just loved the Mario Doll. Just finished crochet everything, now I just have to put together. I did notice that the pattern didn't in the shoes. Would it be possible to get the shoe pattern to finish my doll. Thank you. Thanx sooo mutch for posting all your patterns! I've made Mario and Luigi for my brother as a Birthday present. Thank you so much! My little brother is a huge mario fan, and I am going to make him Mario, Luigi, and a mushroom or two for Christmas! Thanks Again!!!!!!!! Thank you so very much for sharing your wonderful Mario pattern. It was easy to follow and Mario looks simply great. My bocfriend loves him. He is now travelling with him in our car, tied to the back of the head rest so that anyone behind the car can see little Mario. Muchas, muchas gracias, por los patrones,es genial que compartas tus conocimientos para enriquecer a otras personas, haré el mario y el Luigi, me encantan. Loved this. Made it. Mentioned you on my blog. 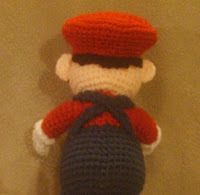 Here's the link... http://csqdesigns.blogspot.com/2011/12/mario-in-plush.html Thanks for the awesome pattern! Danke für diese super Muster,ich bin begeistert.Hoffentlich verstehe ich alles richtig um ins deutsche zu übersetzen. Check out the mario I did with a friend! We went with a more retro look. Sorry I messed up the link above to the mario picture. Thank you so much! The perfect birthday gift for my brother who has been a nintendo fanatic since the late 80's when he played Mario as a little 3 year-old kid! You have a kind heart to share your expertise like this! I would LOVE LOVE LOVE a Yoshi pattern too! Thank you so much for this, when my son was little (a long time ago lol) we went to our local Pizza Shop, and he whispered to me.. "Mom, that guy looks like Mario" that guy, was an old family friend who happened to own the shop. I am going to make this for him 'cause when I told him this story he called my son Luigi from then on. I wanted to thank you for posting this pattern! A friend of mine has a nephew who is fighting an aggressive form of AML (leukemia) he was just 5 years old when diagnosed (now he's 6) and I immediately set out to locate a Mario pattern since that is one of he favorite characters. I sent Mario off to live with Ryan and help keep the bad days away last year...sorry I am so late posting my thanks... Anyway here is a link to my own blog where his and Mario's picture are..they are the first picture you will see. hola!!!! me encanto el Mario Plushie. y también tengo problemas con la traduccion por ejemplo en la Cabeza, vuelta 17, me sale la palabra diciembre acá eso es un mes del año me podrias explicar con otras palabras??? si podes también mándame la simbología. Gracias!!!!!! Thank you for sharing. I've done my own Mario Amigurumi. You're my new favorite person. I'm on a spree making all of your mario patterns! I've already done about half of them, and I need to go get more yarn. I would like to point out to you if you don't know already that you have a few typos in some of your patterns. I'm not very bothered, but just in case you want to change it. Thanks so much for sharing your patterns! wow, this Plushie is truly amazing. i tried to do it however when i started doing the head it came out too small so i was wondering if you were using U.S terms or U.K terms because there is a difference between the two. Muchas gracias por tu generosa ayuda! He terminado el mio y a mi parecer (y el de mi hija) quedo super!!! Te dejo el link de mi Blog donde lo publique y te doy el credito. Tus instrucciones son muy claras y precisas apesar de que mi idioma es el español. I can't wait to make Mario!! It will be my first amigurumi but I have been crocheting for about 5 years. My husband is super excited for it and I want to make one for my brother-in-law. Thanks so much!!!!!!!!! I'll let you know how it goes. Help! I don't see any Red Shirt instructions, I went back and checked multiple times, thinking I overlooked it. I have all the other parts made for my son's birthday gift, Please email me @ elfwench@earhtlink.net with the shirt details? Thank you so much, this is a wonderfully written pattern! Where did you get the eyes? I love all your designs! For any future posts, I would like to see the approximate completion time for your projects. Oftentimes, I see designs that look like they won't take that long, like this one, and then it ends up taking much much longer than I expected! At least with an approximate time I'll know what I'm up against. Hola! Antes que nada, escribo para felicitarte por tu creatividad y lo bien hecho de tu trabajo. Estoy tratando de hacer a Mario y tengo duda de los puntos que deben ir en la mano (vueltas 7 y 8) tienes un correo para que me ayudes a resolverlas? Gracias! Did you buy all those part apart ? I am really impressed! I am not sure I can do it, LOL. So cool, thanks for this pattern, just started making a Mario for my little nephew, he's going to LOVE it! Love this. Do you sell these also? 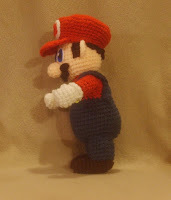 I cannot crochet anymore due to my hands cramping and my 4 yr ols loves Mario. I am going to use this pattern for loomigurumi (crotchet with loom bands) for my son. I just have to figure out something different for the felt pieces. Thanks for the pattern. In my last comment nearing the end of the paragraph the word checked should be chained. Do you think you could tell me how tall he is in inches? By the way love these so much! Looooove this pattern, it just became my next project. I'd like to crochet the eyes as well, do you have anything that might help me with that? Do you have a download for both Mario and his freind, cant remember his name. No, they aren't available as downloads. They are free on this site though. HI, Thank you for sharing this pattern. I am having trouble with the last row of the hat, the one made of slip stitches. After it says to put two sc in the corner, I am assuming you refer to the corner where the brim meets the hat? And then, what direction should I follow? All around the hat? Please help! Could you give me an idea of how tall and wide the plus how is please? Thanks! I meant, the size of the plushie please. Thank you for creating this wonderful, amigurumi pattern. My son has made two new friends, in his Mario brothers. I also made Luigi. You can see more on my blog post, about it. Some notes for those in Australia or UK, where 8 ply wool is more commonly available, I made mine with a 3.5mm crochet hook. Mario turned out to be 7.5 inches tall, with Luigi, slightly taller, at 8 inches high. It's more challenging to crochet in the front loops only, for the changeover from the hands, to the arms. Because the arm is so narrow, and the yarn is not as thick, I had to crochet through both loops to strengthen the join. I didn't get the lovely cuff on the gloves, the pattern creator did, but I was more confident the hands would NOT get pulled off, during play. So keep that in mind when using the thinner, 8 play wool. I am so happy to have found these patterna that I donated to you...THANKS! I am about to begin the brim of the hat and attach it to the Hat. I'm just not exactly sure where to begin that Row 1. I'm not sure what you meant by the "joining stitch" of the final round. Round 14 of the Hat was single crochet around. So, for the brim, do I begin in the first or last of that round14? Overall, your instructions are excellent! Please read above and maybe that joining stitch is stitch 6 in round 13? After receiving several emails from people asking me where they could send a donation in appreciation of the patterns I have for free on my site here, I've opted to put a donate button up for those who wish to do so. Thank you very much for considering my patterns worthy of a donation. You are also welcome to email me at WolfDreamerOTH@gmail.com. Images and patterns contained on this website are © Linda Potts, 2009-2011.. Travel theme. Powered by Blogger.